Many years ago I used to own one of these organs (I'm pretty sure I've got the right model identification). They date back from the mid-1970s, they're an analogue device, one of the traditional electronic organs that sort-of emulate a theatre organ, and the rock organs, this one being of a size that was probably a bit big for a home, but a bit too small for a hall. I ended up trading it in when I bought my Technics SX-U90, something which I regret for two main reasons: The synthesised Leslie effect in the Technics isn't very good, and neither is its paltry eight-note polyphony per keyboard (it could only play eight notes at a time, whereas the Yamaha could play as many as you could press). You really notice the difference between eight-note polyphony and all-keys polyphony if you slide your fingers down the manual with the sustain turned on, or if you try to play with both hands on the same keyboard. You hear notes disappearing on the Technics as it runs out of tone generators (which is probably why it has a very short sustain—so the notes decay away before they're very abruptly cut off). It had their version of a “Leslie” ™ speaker (I don't think it was a true Leslie speaker), which was a rotating horn shaped speaker with a polystyrene voice cone, mounted to spin vertically instead of horizontally. It only passed the midrange and treble through it, the bass was unmodulated. It had the traditional choral (slow) and tremolo (fast) effects, with variable speed on the tremolo. And I seem to recall that you not only select whether the upper and/or lower manuals went through it, but the upper manual flutes and other voices (strings, reeds, and horns) might have been separately controlled (flute split—flutes through the rotating speaker, bright instrument voices to the ordinary stationary speakers). 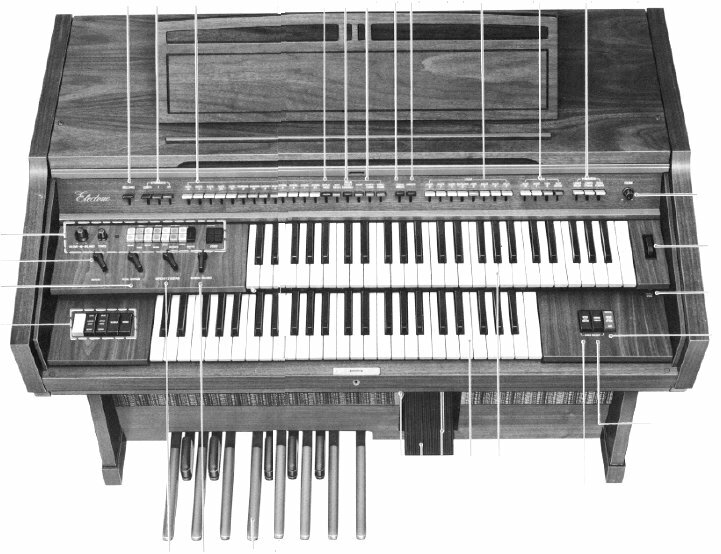 One of the nice things about the Yamahas was how they'd sort-of copied Hammond's drawbars. Most of the voice tabs were variable level controls (with about three notches, so you had a few quickly presettable levels between nothing and full level). Not only did this allow you to mix the voices, which is very useful on the pedals where the 8′ flute will usually badly boom over the 16′ flute in most rooms, not to mention the extra versatility in voice registrations that mixers have over simple tabs or stops, and it also means turning voices on and off is smooth, rather than the abrupt “click” that you'd get on many organs with tab-controlled voices, if you did it while a voice was still playing (bad, I know, but hard to avoid if you're using sustain). It had a few instrument effects for the upper manual (electric piano, harpsichord and vibraphone, if I recall correctly), but they weren't that thrilling (analogue synthesis of such instruments wasn't very good back then). You had a choice where they'd play instead of the other upper manual voices, or with them. The upper and lower manual had a decent amount of flute and other organ voices for home use, as well as some effects that seem to be copied from theatre organs—fake cymbals and drums on the pedals (though you just got some sort of “sschw” and “thwft” sort of sounds from them, yes making silly noises with your mouth would have sounded better). There's a table, below, of what I seem to recall were available (corrected, more recently, after seeing someone else's photos of the same organ). It had some unusual features, like a touch sensitive upper manual for one of the vibrato modes—if you wobbled your fingers on the keys it'd wobble the pitch (not that I could ever manage to do anything useful with that effect). There were some input and output connectors under the front, and a tone cabinet connector on the back (for a Leslie). It was nice and loud, though certainly not HiFi (it was a bit hissy and noisy, like many amplifiers from the era). The rotating speaker sounded really good (much better than the simple vibrato on our old Hammond 123J3), even if it wasn't as good as a real Leslie on the old Hammonds. And it was certainly a large and heavy beast. For those who wonder what it sounded like, I've managed to find a recording of my Yamaha D30 Electone organ I made back in the 1990s (the song “Tomorrow,” from the musical “Annie”). It's not a particularly good recording, but it's the only one I made. I only made it while testing out an ancient reel-to-reel tape deck, and didn't put much effort into making a good recording (neither the sound quality, nor my playing), 'twas merely a brief, spur of the moment, thing. The file is an Ogg Vorbis digitised copy of that recording. Sorry, but I'm not going to make an MP3 of it, so don't ask. And if you can't already play Ogg Vorbis files, visit the Ogg Vorbis website to find out how. Since then, I'd forgotten how to play all of the tune, so I've studied the recording, and this is the best transcription of what I played that I can manage to work out (of how it's meant to be played—originally I went through the verse and chorus twice, and forgot the last eight bars at the end).